One aspect of any food that must be considered is allergies. A study conducted in the United Kingdom (Atkinson, 2003) found no evidence that chia exhibited any allergic response. This was the case even with individuals having peanut and tree nut allergies. In another study, Ayerza and Coates (2006, unpublished) used the enzyme-linked immunosorbent assay (ELISA) to compare the serum of rats fed chia seed (whole and ground) and chia oil to a control diet. As the ELISA test has found applications in the food industry in detecting potential food allergens such as milk, peanuts, walnuts, almonds, and eggs, it was thought that this might be useful for chia. Although the results of the trials were not statistically significant, the overall trend of the data did not support a finding that allergenicity was an issue. In summary, allergies to nuts and seeds are among the most common allergies seen in the Western world. They are characterized by symptoms with a high potential for severity (IgE mediated symptoms), which merit an appropriate diagnostic work-up and require measures to prevent subsequent accidental reactions. 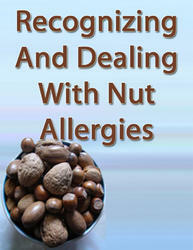 Allergies to nuts and seeds are usually long-lasting, and are currently incurable. Continuous introduction of new foods into the Western diet will inevitably lead to new seed and nut allergies. A number of new approaches to the treatment of IgE-mediated food allergy are being examined. In a double-blind placebo-controlled study of monthly injections of a preparation of anti-IgE antibodies, treated patients with peanut allergy required significantly greater amounts of peanut protein to elicit allergic symptoms compared with control subjects. Another anti-IgE preparation has been used in the treatment of asthma but has not been evaluated in peanut allergy. Theoretically, anti-IgE antibody treatment should be protective against multiple food allergens, although it would have to be administered indefinitely. Other experimental approaches include a concoction of traditional Chinese herbs, injection of heat-killed Escherichia coli containing mutated recombinant peanut proteins Ara h 1 to Ara h 3, the use of immunostimulatory sequences, and the use of chimeric protein that could form complexes with allergen-specific IgE bound to mast cells and basophils. Avoidance of food allergens focuses on dietary avoidance but attention must also be paid to exposure via skin (e.g. peanut oil in cosmetics), mucous membranes (e.g. kissing) or inhalation (e.g. peanut dust, steaming milk or fish). Accidental reactions are common in children with peanut allergy, 50 reported reactions to peanuts despite avoidance over a 2-year period 38 . Individuals with a history of immediate allergic reactions, anaphylaxis, those with asthma, and those with allergy to foods typically associated with severe reactions (i.e., peanut, tree nuts, fish, shellfish) should be prescribed an epinephrine self-injector. All IgE-mediated, allergic diseases, the efficacy of omalizumab in other allergic diseases needs to be fUrther considered. Several large studies have already established efficacy in allergic rhinitis (83,86,87), and preliminary investigations have already shown efficacy in other IgE-mediated diseases such as peanut allergy (94) and latex allergy (90). Future studies are likely to evaluate omalizumab in patients with severe allergic asthma and with concomitant rhinitis and eczema. In the latter case, pretreatment, e.g., with pimecrolimus and antibiotics, could drastically reduce total IgE levels and thus lead to a situation where anti-IgE treatment had a realistic chance to eliminate IgE antibodies relevant for the allergic disease. Peanut is also known as groundnut or arachis, so these three names need to be sought on labels of manufactured foods as well as some pharmaceutical products. The difficulty comes with 'vegetable oil,' which may include peanut oil only by writing to the manufacturer of individual products can the composition of the vegetable oil be determined. It is not known to what extent subjects with peanut allergy should avoid peanut oil. Most peanut oil used in food manufacture is highly refined, and contains only very minute quantities of peanut protein. In a number of small-scale studies, subjects with peanut allergy were found not to react when given highly refined peanut oil. However, it remains possible that such oil contains traces of protein sufficient to result in enhanced reactivity, such that when the subject does ingest peanut accidentally the reaction is worse than previously. On this basis, subjects with peanut allergy should really be advised to avoid peanut oil. Whereas peanut allergy is usually lifelong. In the North American study referred to previously, it was found that the offending food or fruit was back in the diet after only 9 months in half the cases, and virtually all the offending foods were back in the diet by the third birthday. A further study of nine children with very severe adverse reactions to food showed that despite the severity, three were later able to tolerate normal amounts of the offending food and four became able to tolerate small amounts.